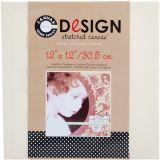 Stretched Canvas - CANVAS CORP-Stretched Canvas: 12x12 inches. Bring your design style to life on the walls of your home! This 100% natural cotton canvas has no gesso applied and is staple-stretched over a wood frame. This package contains one medium texture 12x12 inch canvas. Imported.